Olympus is offering some great deals on its cameras, lenses and various accessories! In addition to the deals below, Olympus is offering 2x rewards on purchases made through Dec. 19, 2018, on getolympus.com, as well as free 2-day shipping on orders over $50. To learn more and see all the Olympus Black Friday deals, visit getolympus.com. Note that freebies mentioned are only guaranteed to be available through getolympus.com, but pricing will be honored by other authorized retailers. OM-D E-M1 Mark II: Offering $100 savings on the body ($1599.99). You can also bundle the body with the M.Zuiko Digital ED 12-40mm f/2.8 PRO lens for $700 in savings. Originally $2699.98; now $1999.98. Savings through Jan. 5, 2019. OM-D E-M5 Mark II: Offering $100 savings on the body ($799.99). You can also bundle the body with the M.Zuiko Digital ED 14-150mm f/4.0-5.6 II lens for $500 in savings. Originally $1499.98; now $999.99. Savings through Jan. 5, 2019. OM-D E-M10 Mark III: Offering $150 savings on the body ($499.99). You can also bundle the body with an SD card, case and 14-42mm EZ lens for $200 off ($599.99). Savings through Jan. 5, 2019. OM-D E-M10 Mark II: Offering $100 savings on the body ($449.99). You can also bundle the body with the 14-42mm II R lens ($499; $100 savings), 14-42mm EZ lens ($549.99; $150 savings) or both lenses for $100 in savings ($699.99). Comes with a free case and SD card. Savings through Jan. 5, 2019. PEN E-PL8: Save $200. Bundled with the M.Zuiko 14-42mm R lens, and comes with a free case and SD card. Originally $599.99; now $399.99. Savings through Jan. 5, 2019. Tough TG-5: Save $70 on Olympus’ most advanced rugged camera. Shockproof, freezeproof and waterproof, with built-in Wi-Fi. Comes with a free case and SD card. Originally $449.99; now $379.99. Savings Nov. 22 through Nov. 26, 2018.
f/1.2 PRO prime lenses: Save $200 on all f/1.2 PRO prime lenses — the 17mm f/1.2, the 25mm f/1.2 and 45mm f/1.2. Originally $1199.99; now $999.99. Savings through Jan. 5, 2019. Zoom lenses: Save up to $200 on all PRO zoom lenses — the 7-14mm f/2.8 ($100 off; $1199.99), the 12-40mm f/2.8 ($799.99; $200 off), the 12-100mm f/4 ($100 off; $1199.99) and 40-150mm f/2.8 ($1399.99; $100 off). Savings through Jan. 5, 2019. 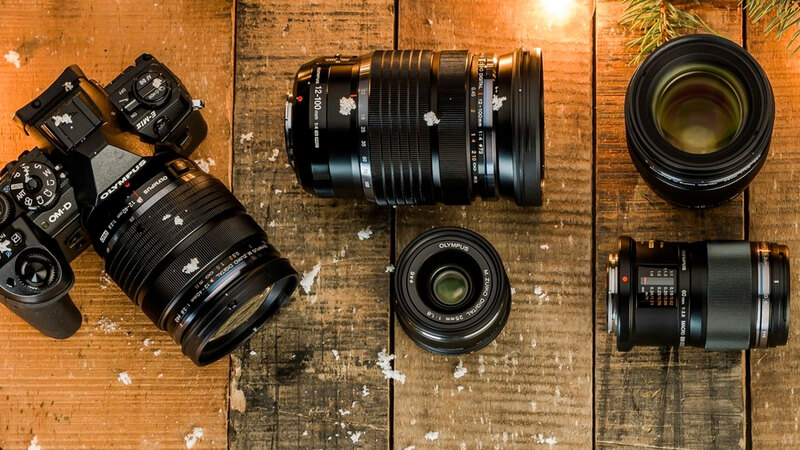 Olympus is also offering several deals on its specialty primes, premium primes and standard zooms. Olympus is offering deals on its FL-900R flash and pro binoculars when purchased with select OM-D or PEN camera bodies.